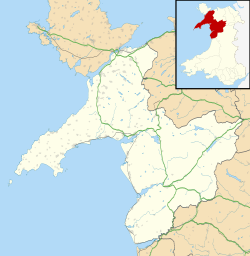 Gwynedd (Welsh pronunciation: [ˈɡwɪnɛð]) is a coonty in north-wast Wales, named efter the auld Kinrick o Gwynedd. Although ane o the biggest in terms o geographical aurie, it is an aa ane o the maist sparsely populatit. A lairge proportion o the population is Welsh-speakin. Gwynedd is the hame o Bangor University an includes the scenic Llŷn Peninsula, an maist o the Snowdonia National Park. The name "Gwynedd" is an aa uised for a preserved coonty, coverin the Isle o Anglesey as well as the current coonty. Culturally an historically, the name can an aa be uised for maist o north Wales, correspondin tae the approximate territory o the Kinrick o Gwynedd at its fullest extent: Gwynedd Uwch Conwy an Gwynedd Is Conwy). Wikimedia Commons haes media relatit tae Gwynedd. This page wis last eeditit on 24 Februar 2018, at 19:53.